Let's get outside and get our hearts pumping! February is the month of love. And as we start to notice hearts and roses and chocolates popping up in shops, why not use this as a reminder to take a moment to get back in touch with your heart? As winter drags on, many of us may be tempted to disappear into hibernation, but inactivity can have a negative impact on our health — including our heart health. Don't underestimate the cardiovascular benefits of a day gliding around the rink. Whether you are indoors or outdoors, skating is a great way to build leg and abdominal muscles, improve your balance and flexibility and, as a bonus, it makes you feel great. Depending on the intensity of your workout, you can expect to burn about 350 to 500 calories an hour. For those who seek an even more intense workout, Canada’s national sport might be for you. Since ice hockey is a group sport built on (friendly) competition, trying to win and score goals is guaranteed to get your heart rate soaring. Whether you prefer cross-country or downhill skiing, you are sure to get a fantastic workout. If you are looking for a total body, core strengthening, aerobic workout, then cross-country skiing is for you. And if that wasn't enough to convince you to get your skis out, you can also expect to burn between 500 to 600 calories an hour (depending on your weight and intensity). Downhill skiing, on the other hand, is all about short bursts of intense cardio. The focus is on your lower body, helping to improve your agility and balance. The average person will burn between 350 to 600 calories an hour, depending on run difficulty. Looking for an even bigger adrenaline rush? Then maybe snowboarding is for you. Not for the faint of heart, snowboarding is an excellent leg and lower body workout that will test your balance and agility. You'll also find yourself burning more than 450 calories an hour. It's no wonder snowshoeing is one of the fastest growing winter sports in the world — it's so easy to get into! Burning around 600 calories an hour, this is a sport that anyone can do, regardless of age or fitness level. As a bonus, there is no better way to calm the mind than spending an hour away from your hectic life, connecting with your breath and the serene beauty of a winter landscape. 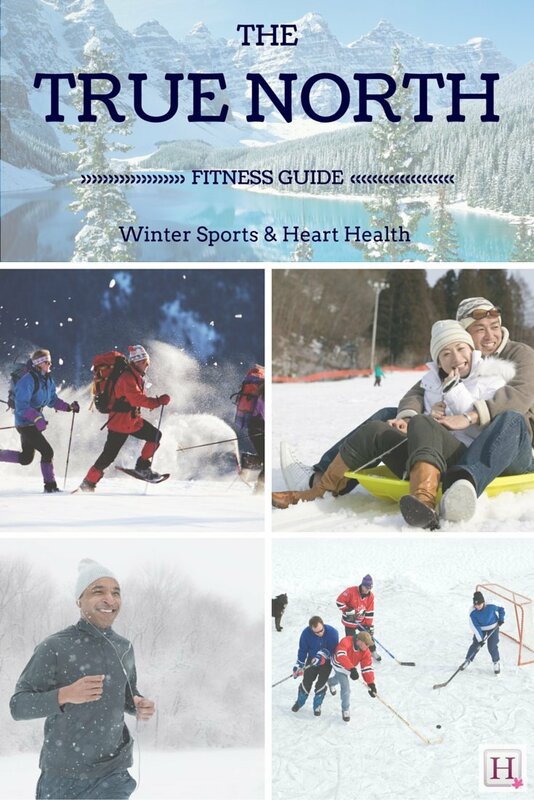 Yes, even tobogganing can be a heart-healthy, muscle-building activity. Walking up hills and pulling a sled through snow with someone on it will get your legs working and those calories burning. You'll be breaking into a sweat before you know it. And every time you trudge back up that hill, you'll be rewarded with a thrilling ride down again. While not traditionally winter sports, more and more people are taking up hiking, walking and running during the frigid months. Hey, if it's not too cold to make a desperate dash for the bus, it's not too cold to jog for your health. Start slow. If you aren't used to physical activity, especially in cold weather or at higher altitudes, start off slow until you become accustomed to the cold. Dress appropriately. Wear clothes made with moisture-wicking fabric, and remember to layer so that it's easy to remove or add items as you sweat and when you cool down. Protect your extremities. This means wearing hats, gloves and warm socks. As your core warms up, you'll find that your feet and hands start to get colder. Cover your mouth. If you suffer from asthma or other respiratory problems, the cold air can make it harder to breathe and cause chest pain. By covering your mouth, you are warming the air before it hits your lungs. Wear sunscreen. Just because it's cold doesn't mean you are immune to sun damage. Yes, you can get sunburned in the winter, so protect your skin. Stay hydrated. We tend not to drink as much water in winter, but remember if you are outdoors and active, your body needs water to refuel and function properly. Spend time cooling down. After a vigorous workout with plenty of sweating, you will cool down much faster than in the summer months. Make sure that you have planned your route or routine, so that you can get indoors quickly after finishing. The winter months can feel long, dark and dreary, but getting outside and having fun will help them fly by. Besides, after a day out in the cold, what could be better than snuggling up with a loved one and enjoying a hot cup of cocoa?